As humans encroach on wild places, encounters with animals--from bears, bison, mountain lions, and mice to turkeys, ticks, rats, and raccoons--have become increasingly commonplace. But, wait, what are the rules for facing a moose up close? Do you run from a coyote or stand your ground? How deadly, really, are black widow spiders, rattlesnakes, and sharks? 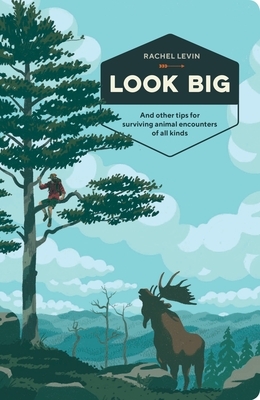 Packed with expert tips, fascinating animal facts, and harrowing true tales, Look Big is a must-have survival guide for outdoor, urban, and suburban adventurers alike. If you have ever feared the approach of a grizzly, the spray of a skunk, or an army of cockroaches in the kitchen, this book is for you. RACHEL LEVIN has written for the New Yorker, the New York Times, Outside, Lucky Peach, and Sunset magazine, where she was a senior travel editor. She is a contributing writer at San Francisco magazine and was recently named the first San Francisco restaurant critic for Eater. A member of the San Francisco Writers' Grotto, her work has been included in Best Food Writing and other books. She has also appeared on NPR's Marketplace, KQED's Forum, and on stage at Pop-Up Magazine. "Hilarious but genuinely helpful. . ."
"Ms. Levin has mastered the art of describing animals and their behavior in archly urban ways. . . a nifty idea carried out with humor and a deft touch." "Look Big is the definitive guide for anyone who has ever wondered what to do in an animal encounter. With equal parts humor and sound advice, Rachel Levin provides all the info you need to defuse a major critter crisis. Just don’t run. Unless it’s an alligator." "Journalist Levin gives well-researched advice for surviving run-ins with coyotes, bears, and moose, among other large animals, along with helpful tips, anecdotes, and charts for dealing with smaller critters, from bees to skunks. The illustrations make it the perfect coffee table book, while its small size means it also fits nicely in a backpack." ". . . lays out expert tactics for encounters with animals of all shapes and sizes with wit." "Rachel Levin’s light-hearted read combines funny stories about wildlife encounters with facts and knowledgeable tips on what to do if you find yourself faced with any one of 50 North American creatures, from alligators to bed bugs. You’ll be ready to walk on the wild side in no time." "This book both amused and empowered me. I’m now prepared to haze a goose or do hand-to-hand combat with a cougar . . . whatever it takes." "Levin takes a fun-filled, practical approach to dealing with all kinds of critters. . . Beyond being a simple and speedy reference book, the gorgeous and often humorous illustrations from Jeff Östberg make this fun to flip through, too. . . You'll likely find yourself spending more time than you expected learning how to look big."